I LOVE the arrow through the neck! I have little brothers and it made me laugh so, as they would have done similar. Adorable! Hi Lisa 🙂 Isn’t it funny how children are all different? 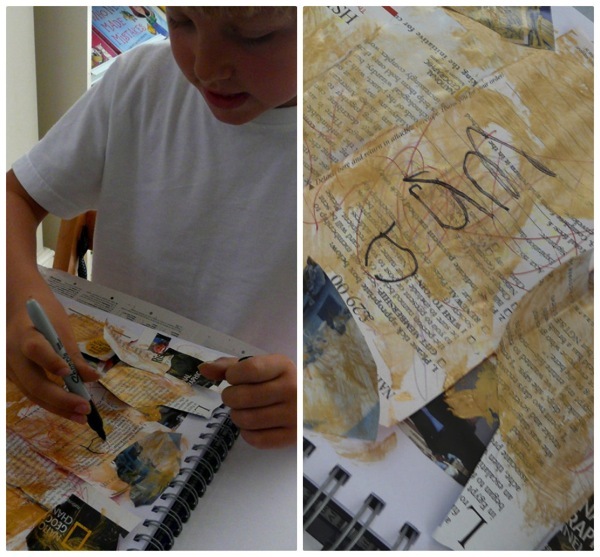 Art journaling suits my kids’ free-flowing style perfectly. Whereas if I suggested they draw a “proper picture” they would struggle! I so enjoy your posts. You stretch me because we are so opposite in our styles. I admire your approach to teaching and mothering and this whole art journal idea has been something I have observed with wonder from afar. I want to do it, but it is so out of my zone I haven’t jumped in and tried it…yet. I am getting close, though. Thanks for sharing and that little boy of yours is precious! You are so sweet, Savannah – thank you for your kind words! It has taken me a while to get comfortable with the kind of homeschooling parent I am, and to stop comparing myself unfavourably with more naturally organised mums. In fact it’s an ongoing process! I love, though, that we can all share ideas and inspiration in this wonderful online world, and incorporate the best of what works for us. You’ve inspired me beyond words! Thank you so very much for all the ideas and sharing step by step how you achieve your journals together. 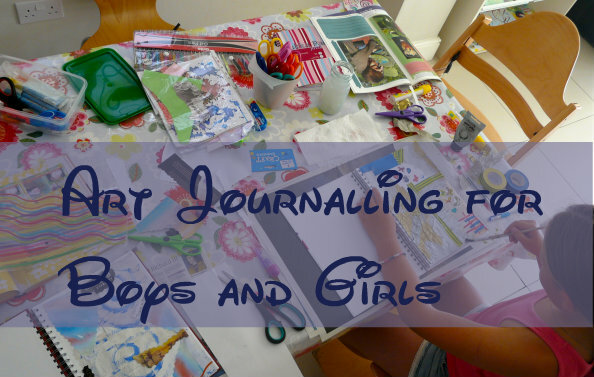 Especially thank you for sharing the difference between boys and girls journaling it gave me some much needed perspective. Thank you Chareen! I really enjoyed this topic. I have set myself an intention this year to try and involve J(8) more in our art by making it boy-friendly, so this was a good start! This is such a great idea! So far outside my box and yet my kids would LOVE it! I may need to try it soon! Thanks! I love how you’ve organised this post into the different ways that boys, girls and mums do it. 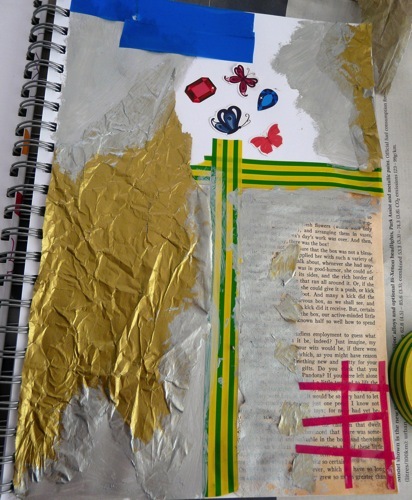 It highlights the freedom that art journaling provides to all. 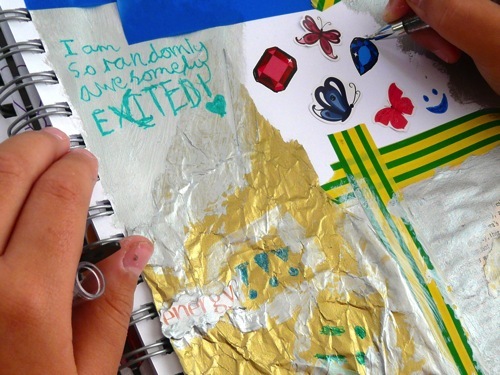 We tried art journaling a few times last year but didn’t stick to it. We’ll try to pick it up again this year. Thanks for the inspiration! J(8) is totally hilarious. 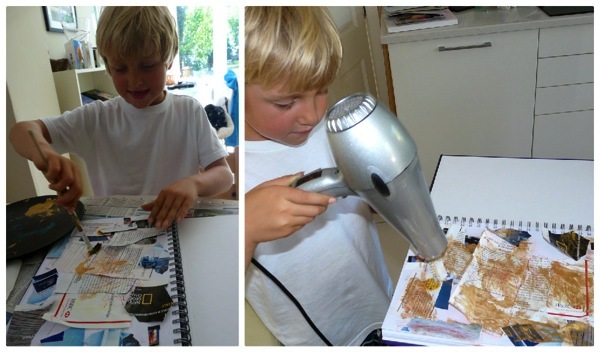 His art making process is so… like a boy’s! 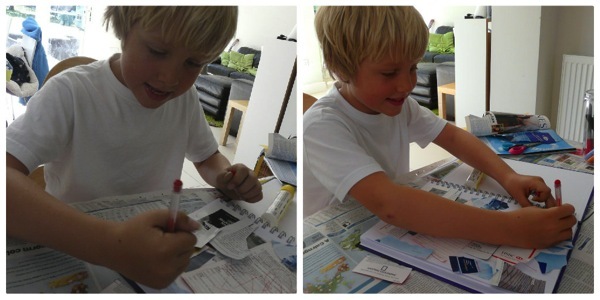 🙂 He is happy at the end of it, and was thoroughly engaged during the process of making the journal page, that’s what matters. How funny – history and French would almost certainly fall by the wayside if J(8) didn’t have a sister! It’s a testament to your relationship with Tiger that you are able to teach him so well across such a breadth of subjects. When I studied NLP I heard it said that we learn best in our periphery. (I’ve often spoken that phrase but never written it. Really not sure of correct grammar!) Anyway, I certainly see proof of that around here! I love to see how the process is progressing. I always wonder about my son’s artwork. It’s so different from the girls, but looks a lot more like your son’s, so maybe he’s not so different. 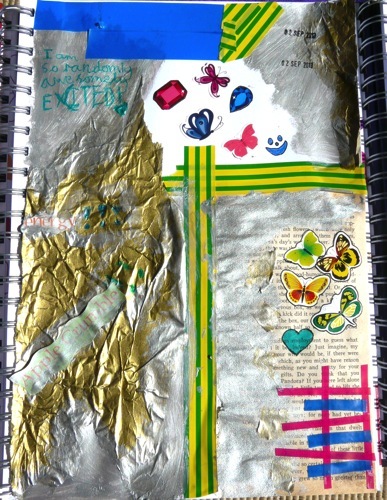 I should try some art journaling at some point. I just watched a video on some art pastels…. I love all your pages, especially your daughter’s. She obviously enjoys doing them a huge amount and her resulting collages are beautifully artistic! Thank you, Claire. I’ll pass on your kind words! Beautiful work! 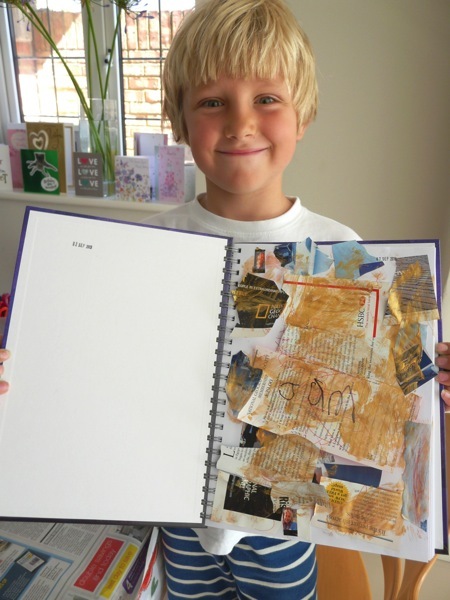 Loved your son’s page, too, and his beaming face! Thank you Sennie! Yes, doesn’t he look pleased with himself?! 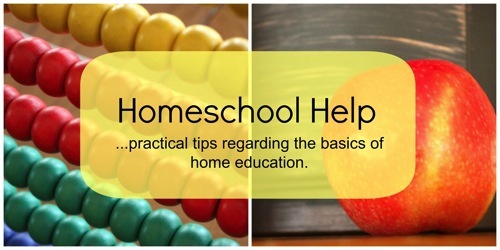 Gorgeous Lula B YOU’VE DONE IT AGAIN – kept me homeschooling! Lol! I thought of you! You would’ve been proud of me -lol- right up to the point it was time to move on and I had to yell to get anyone to help me clean up the ensuing mess 😉 ah the joys…. oh you DO cheer up the grey rainy days, Claire! I can JUST imagine the fun (and then the cleaning up…)! I have to do anything like that first thing in the morning and then take a few hours off to recover! 😀 Totally worth it though! 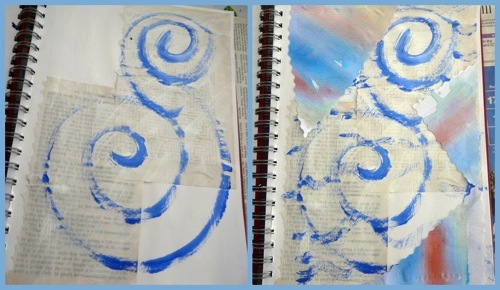 Great tutorial for art journal. 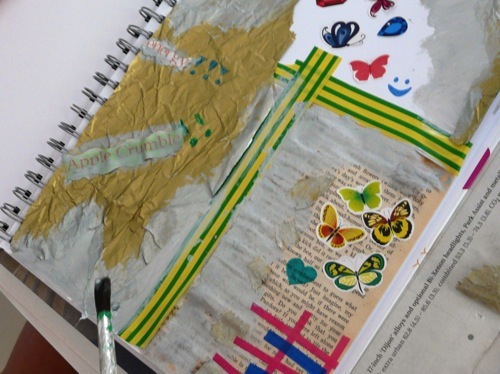 We’ve done art journaling off and on but the way you show it makes it really easy to do. Maybe we will give it another try. Thanks Holly. We usually try to find the easiest way to do things around here – that way we get around to doing them! Absolutely love this post. 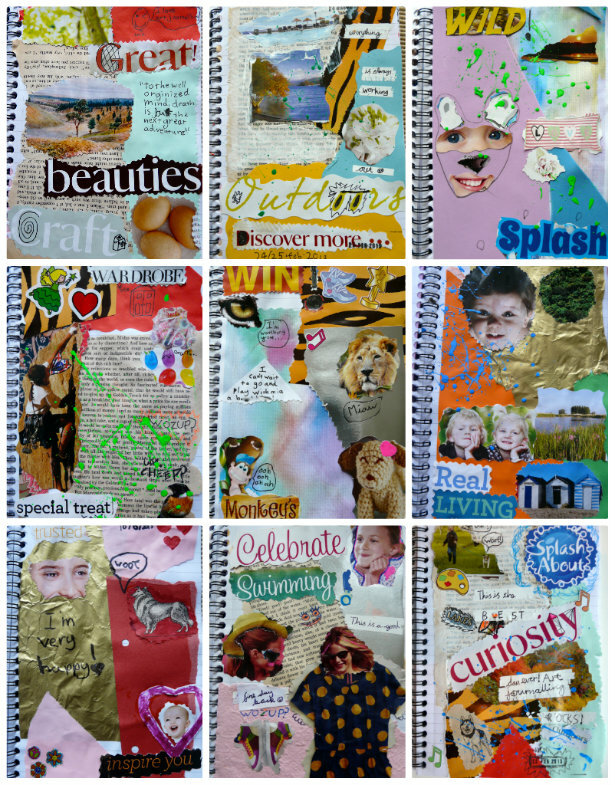 I love the differences in the girls and boy journals. I am thinking we are starting this in October when we return full time. How often do you have them journal? Thanks Melissa! C(9) usually journals about once a fortnight. This was J(8)’s first time so we shall see! I try and work alongside them. It often feels like there are other things to do, but I know once I get going I really enjoy the process of creating together. Goodness! I laughed so hard when I saw the picture with the arrow. 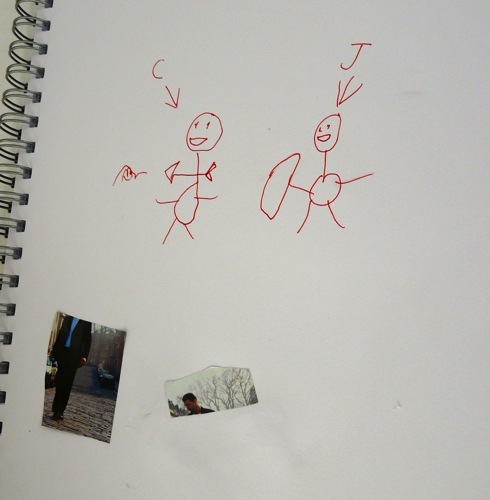 I could imagine my DS8 doing that with a drawing of his sister. Art journaling is actually a hobby that I’ve been thinking about for me, so I loved seeing the pages that you and your children made. Thank you Rebecca! It’s so funny that I never even spotted the arrow until I posted the photo, and so many people have commented that it’s like their own boys’ art! 😀 I really enjoy art journaling, I hope you do too. Such great ideas. 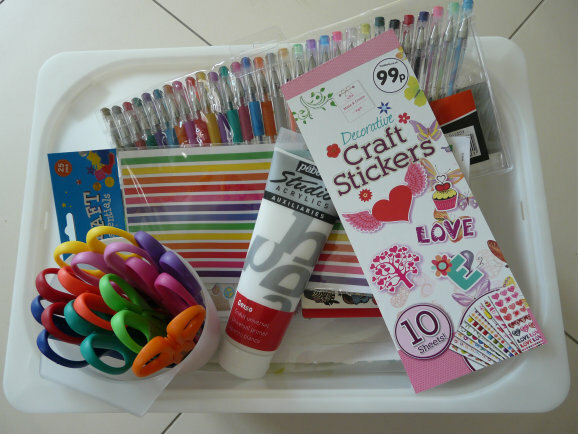 We have never done an art journal, and I think we may just need to try. I love all the creativity and color. Thanks for sharing! Thank you, Christy! 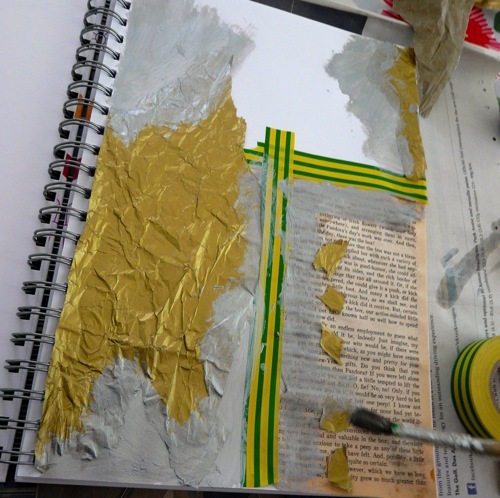 Art journaling really is a great creative outlet – I highly recommend giving it a try! I love this art form! I think the arts are so important but Jeremiah is a techie through and through. However he may enjoy this activity. We shall have to try! I also love how respectful you are toward your children. I’m a firm believer that if parents want respect from their kids that they must respect them also. J8 seems to be so much like my Jeremiah it’s hysterical! Thanks for sharing at FF. Thank you for your kind words, Sylvia. I shall be following your posts – I might learn something to help me understand J(8) better! 😀 Thank you for hosting Friendship Friday, it’s a lovely link up. I LOVE THIS!! You know that I am teaching an Art Journaling class and I have gotten ideas just from reading this. I love your daughter’s pages. And how interesting that you put both Boy/Girl results. I want to do so much with my class. I am so excited to see how this progresses. I am off to look at Notes on Paper. I am laughing at the ‘arrow through the neck” Can’t wait to see more posts on this. 🙂 Happy weekend! I think it’s so cool that you are teaching the Art Journal class. That’s one that I can actually imagine myself doing – it would be so much fun seeing the creativity of a group! Love it! My daughter was been keeping a journal of inspirational saying, decorating the letters, creating borders, etc. It’s given her an outlet during our difficult months of adjusting since my separation and divorce. Journaling is as unique as the individual! Thank you 🙂 I think my journaling really helped me through my childhood challenges, too, Jessy. Your daughter’s journal sounds beautiful. What a lovely post! Great ideas!! Saw you linked at SYCYAHSer also and clicked over…. Have a lovely weekend and be well! Thank you so much, Chris! I hope you’re having a lovely weekend too! 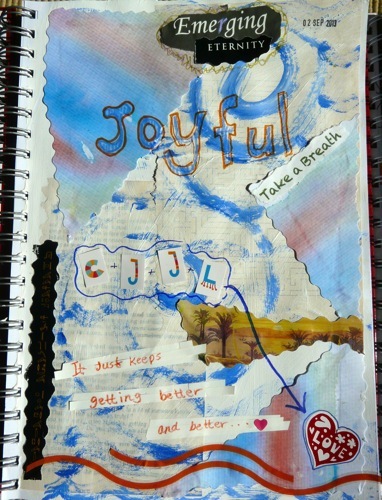 I love your journal pages. I also love J’s smile as he poses for the camera with his page. He looks very happy with his work! Thank you so much, Sue. I love how J throws himself into everything like a joyful whirlwind! Thank you so much Jennifer, I’ll stop by on Friday!